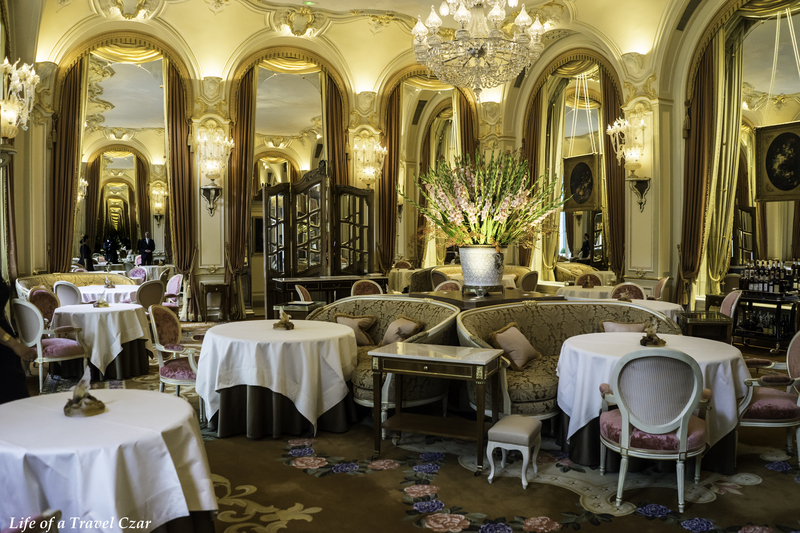 I arrive at the Ritz in Paris for lunch; it’s been way to long for me. The hotel has been closed since 2012 as it underwent an extensive $450 million renovation. 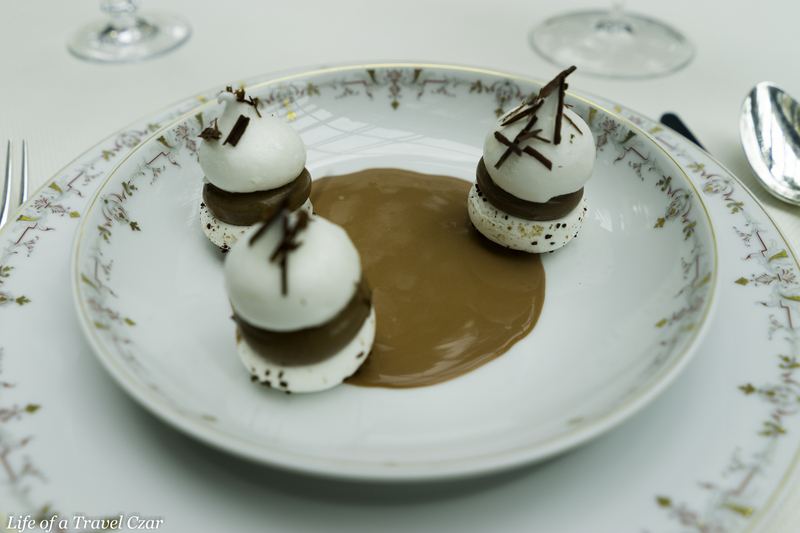 I always enjoyed my time at the Ritz and I think L’Espadon would have to be one of my favourite restaurants. 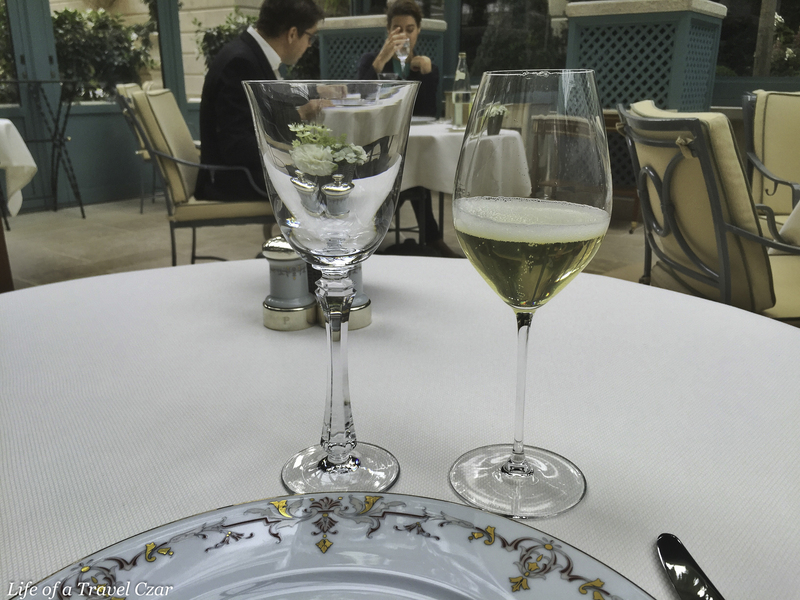 I first dined there at the age of 21 and I have never forgotten that experience – it was one of my first introductions to true fine dining and it certainly planted the seed that became Life of a Travel Czar. I return to the venue in anticipation. Post the renovation and the new chef, lunch is now always served in the atrium courtyard with the main dining room being used solely for dinner. The service is impeccable at this place, several of the staff (who are dressed with the finest suits and ties) greet me as I walk in and usher me to my table. Every minor detail is attended to and I couldn’t fault a single element of the service. It’s almost as if nothing has changed in four years. I am asked if I would like a Champagne to start and I cannot find a reason to refuse. I choose the Amour de Deutz, Blanc de Blancs to commence proceedings. I gaze for an age at the pale clear golden tinged champagne with the fine pearls of bubbles escaping to the top of the glass. The beautiful sun casts a welcomed glow across the courtyard while the conversations from other tables ease into a background symphony. The art of lunching is truly on display. 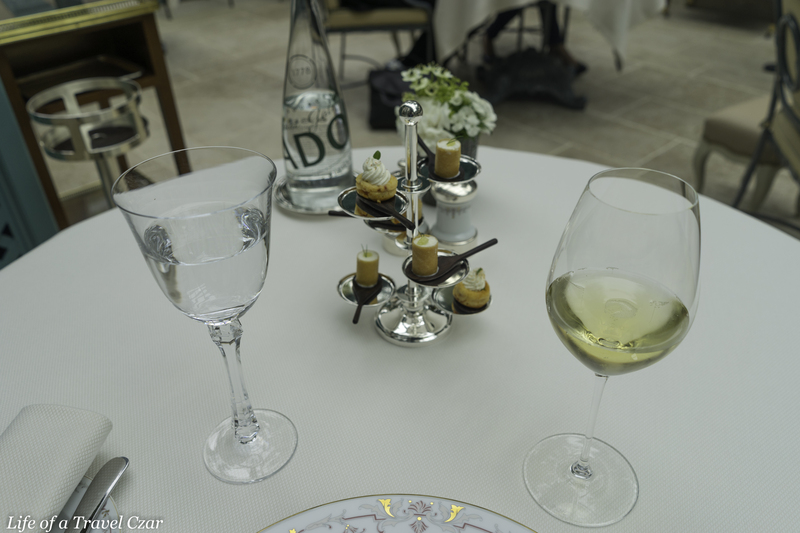 I couldn’t go past the Blanc de Blanc which is tapestry in its finest form with the majority of the Chardonnay being sourced from Avize and the renowned town of Mesnil-sur-Oger. I reach for the glass with my hand trembling in anticipation of the sip of the ‘Blanc de Blancs’. I station the glass under my nose for a moment to gather the waft of white peaches, floral notes, honey and golden baked brioche. On the palate its fresh, clean, velvety… the champagne glides with a skaters touch on the tongue with the coattails of a marvelous elegant ‘Zelda Fitzgerald like’ minerality flowing shortly after. It is so deep and lingers for an age. There are wonderful hints of shellfish and salinity in the finish which reflect its purity and leave one feeling breathless in the process. The introductory canapés are brought out to whet the taste buds as I peruse the menu. The chill of the jelly and crème send goose bumps through one’s body even on a sunny day in Paris. 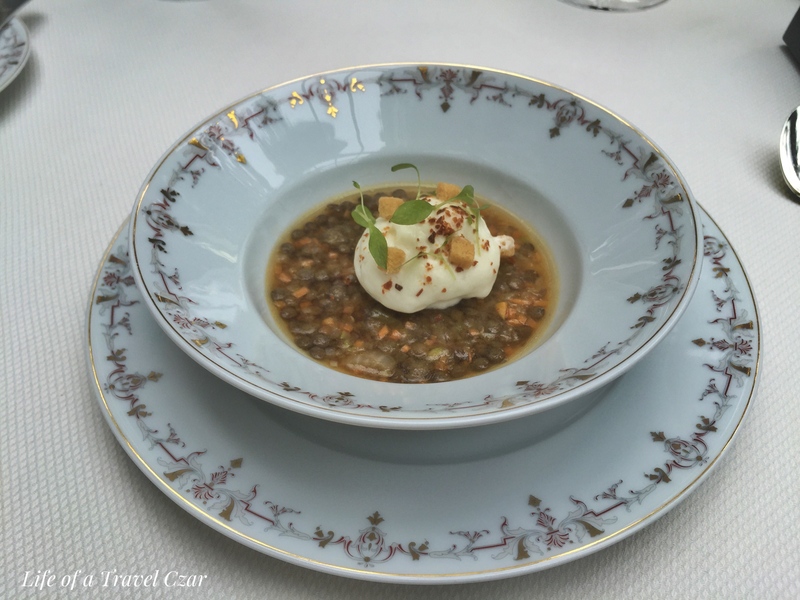 The dish is about textures, the soft foamy crème, the jelly and the texture of the lentils. The dish is almost the candle in a cellar as it lights the path for the menu ahead. 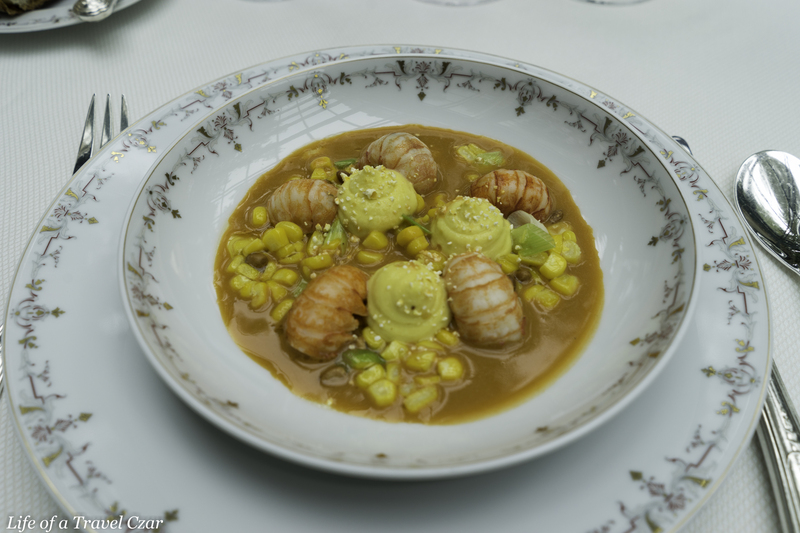 The crayfish is cooked in cognac with corn emulsion and pieces of corn and pinenuts on the base of the dish with a crayfish sauce reduction. The Escoffier-style of culinary preparation and presentation is one most charming things one could ever experience. It is an art which dying so slowing it makes me awfully sad. The crayfish and corn base is brought out and plated. 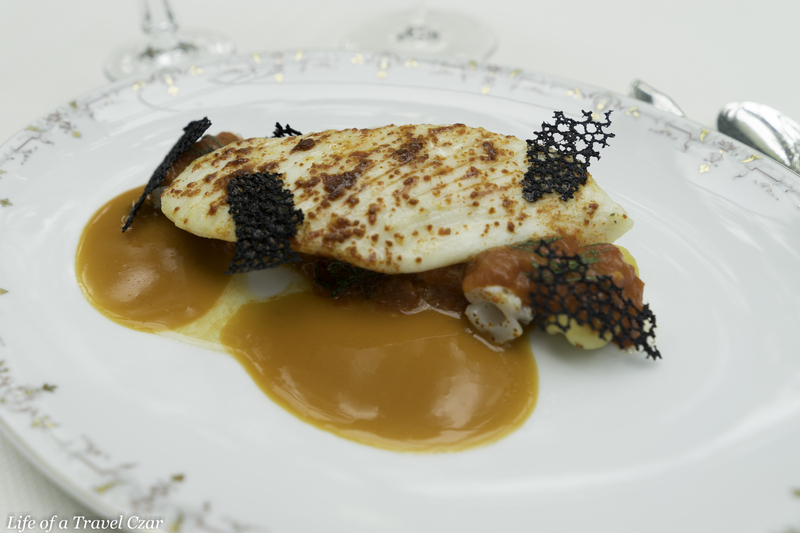 Then in classic sense that make Auguste Escoffier himself smile if he were still with us, the rich bright orange crayfish reduction sauce is poured onto the dish to complete the experience. 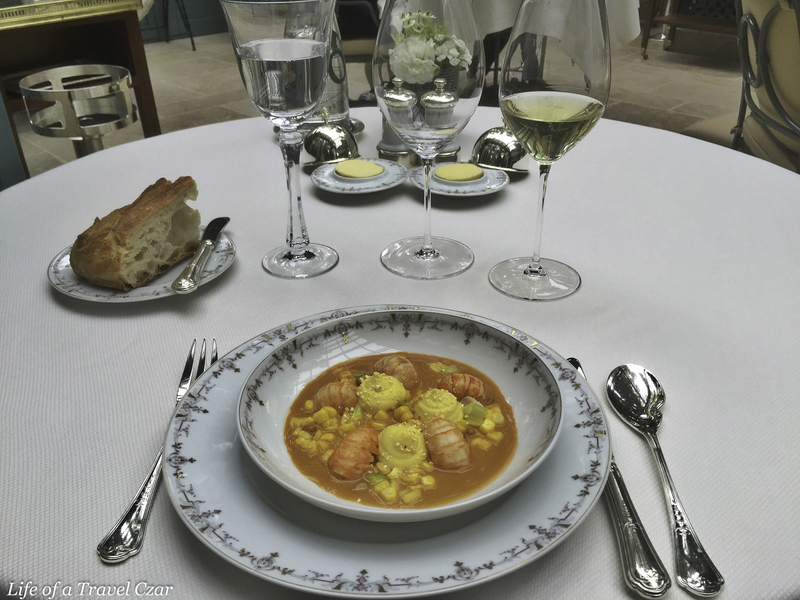 The light sweetness of the crayfish with the tinge of the cognac is cornerstone of the dish. The smooth creamy corn offers some balance from the richness of the dish and some lovely textural contrasts with little nibs of corn and pinenuts interrupting the harmonious glide of the bisque down the tongue. The mineral saltiness and rich crème base of the crayfish reduction is fusion made in heaven. 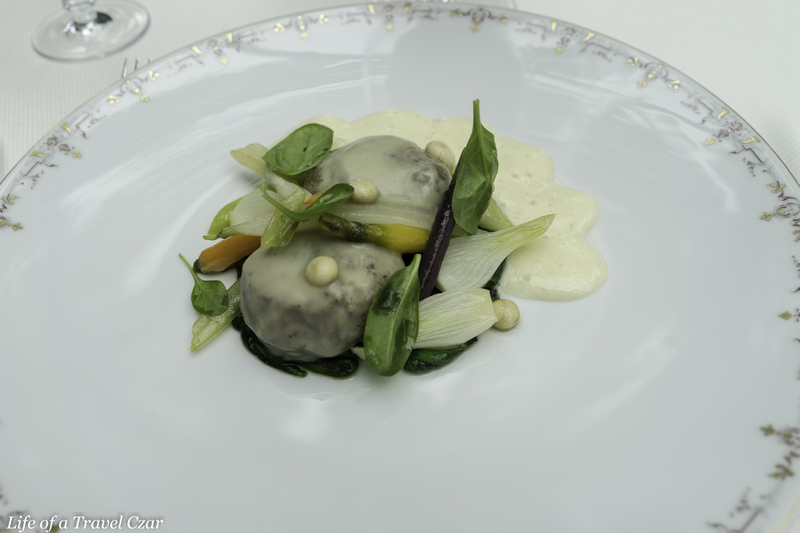 I opt to pair this dish with the Amour de Deutz I started with. The amazing rich minerality and acidity of the Amour de Deutz is perfect for the crayfish, cutting through its richness like an exquisite medieval knight’s sword. The saline touch of both dance together to make a lovely pairing. I opt for the Domaine du Monteillet, Condrieu, Les Grandes Chaillees. 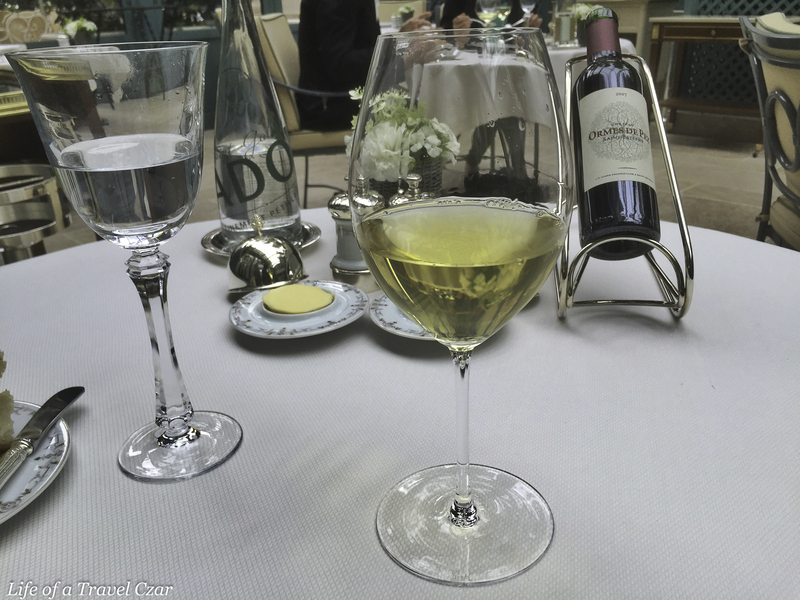 It’s a classic viognier – the rich salinity with its beautiful clean taste and minerality defines the wine. On the nose there are beautiful fresh citrus notes with light mint and apricots. On the palate there is the richness of the salinity and wonderful citrus notes but with limited sharpness in bite than expected. It’s decadently rich and the citrus and spice notes linger into a long finish. The flakey fall apart Dory has a soft and delicate texture. The natural salt of the fish drives the flavour. The spice and the tomatoes are the perfect partners in acidity. They intermingle and deliver the right tasting experience. The gnocchi has this soft moist pillowy texture and works well to mop up the sauce while displaying their refreshing herby basil infusion. The squid is simply done and cooked just right to showcase its discernible natural flavours and a light smoky residue. The viognier and its match with the spice and acidity in the dish makes the taste experience all so integrated like a fairytale ending. I select a beautiful wine from Bordeaux to see me through to the finish. 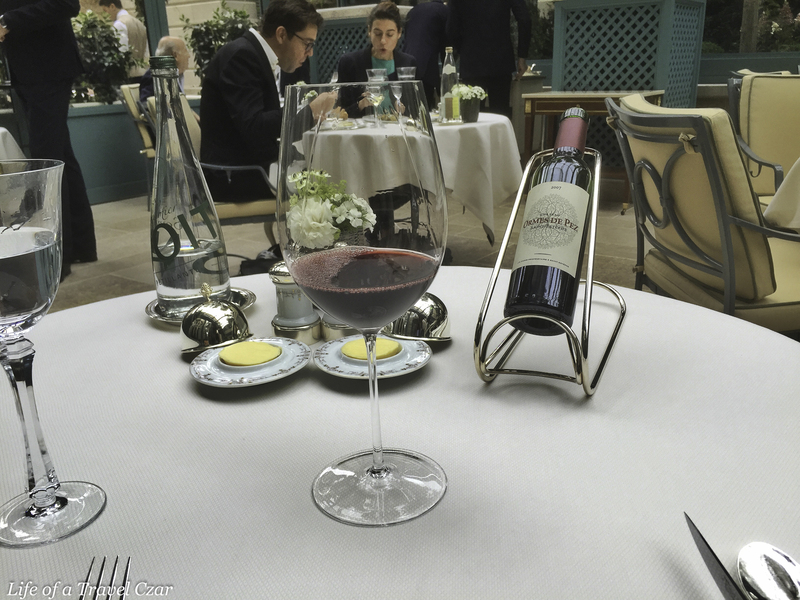 The wine has an amazing ruby colour with aromas of cassis, blackberry and mild tobacco with some light floral notes. On the palate the wine carries the flavours of its aromas quite well with some additional sweet spice notes. The wine proves to have a very light acidity and plenty of grainy tannins which flows into a dry finish. It is that wine that one sits by the fire place to savour the drop over a lovely leather-bound book… or that’s the sense I get. The veal is brought bare with the vegetables on the base. A yellow wine sauce which is super light and foamy is poured over for good measure. The veal is fatty, juicy and very tender, however the salt was a little too much and did detract from the dish. The vegetables (which include some turnips, mushroom, carrots) were perfectly cooked and provided a lovely base to the dish. The wine pairing works well with fat and juice of the veal being flowed through with the lovely tannins of the Bordeaux. The slight excess salinity of the veal did pose some mild interference in the pairing. The petit fours are a treat, we have dark chocolate mousse, almond financier with burnt butter caramel and a lemon meringue tart. 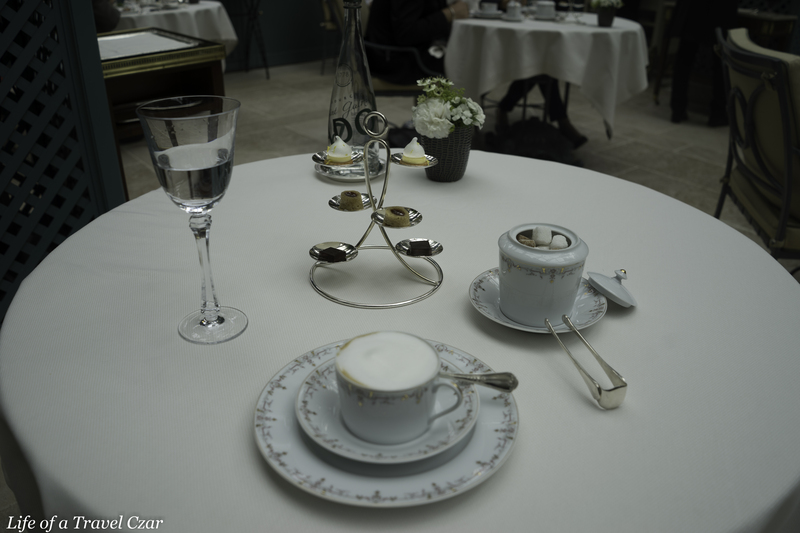 I sip my cappuccino and it brings some energy back to me as I taste the little desserts and let the afternoon waste away. It is such a pleasure. The key to Escoffier-style culinary experiences is the plating and pouring of the accompanying sauces. I have compiled a little video of time at lunch which I think adequately describes the experience. The tune in the video is Stay by C3 Oxford Falls. I do not own any rights to the song. I walk back through the main dining room which is such an exquisite palatial picture (see below). It is used exclusively for dinner and I look forward to dining here on my next visit. I leave with a sigh of sadness, I may have left the restaurant but my heart is still there. 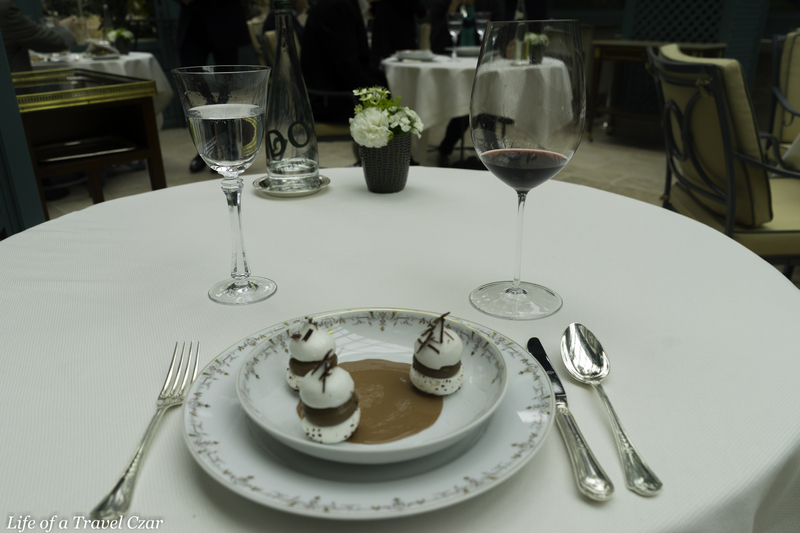 I belong there… it was one of my first ever fine dining moments, the experience I had many years ago shaped my life… there is something so special about this place that I cannot describe. The charm, the grandeur and the cutlery, glassware and setting provides a sensory overload before the first dish is even served. Every moment is a treasure at this place. I enjoyed your descriptions. 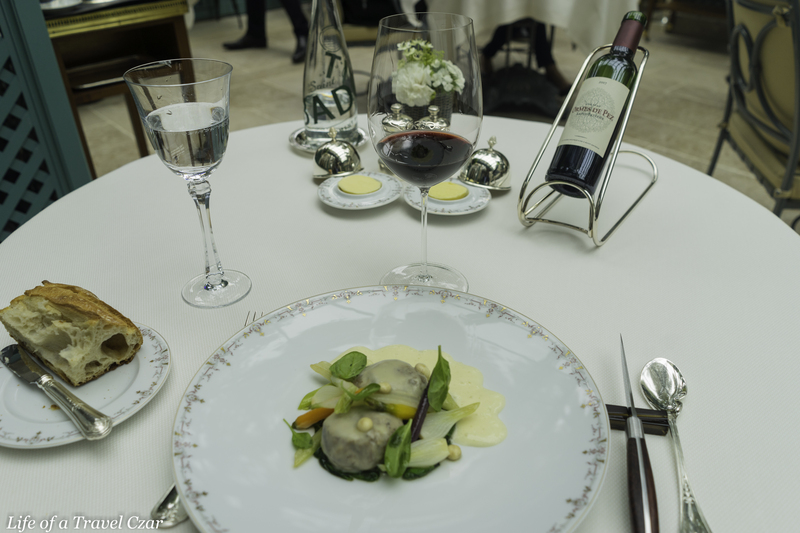 Exquisite food in an exquisite setting. Perfect!